Interesting post/infographic from the Woork Up team which takes a look at Internet penetration rates across the world. The focus of the post is to show that although North America and Europe have huge adoption rates, places like the Congo, Mozambique and Burundi still have extremely low Internet penetrations rates of 0.5%. Additionally, countries such as Myanmar and Bangladesh have penetration rates of 0.2% and 0.4% respectively. Larger countries such as Russia and China come in at 43% and 31% respectively. 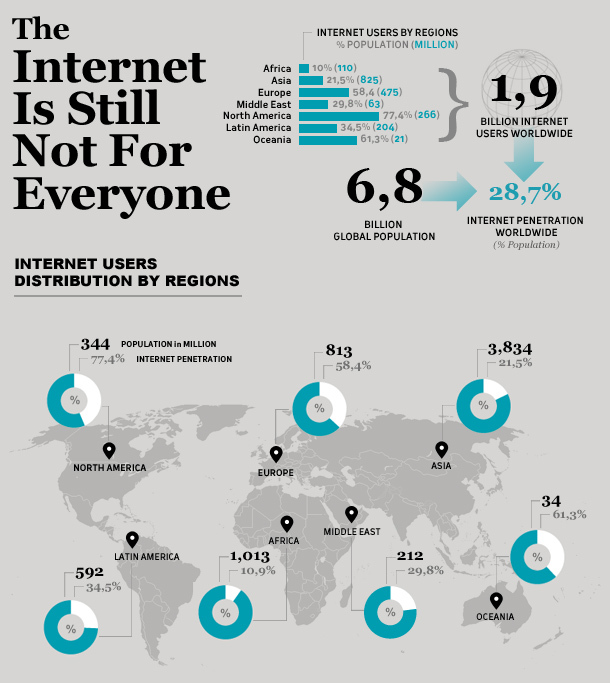 The infographic below shows a breakdown of Internet penetration by continent.